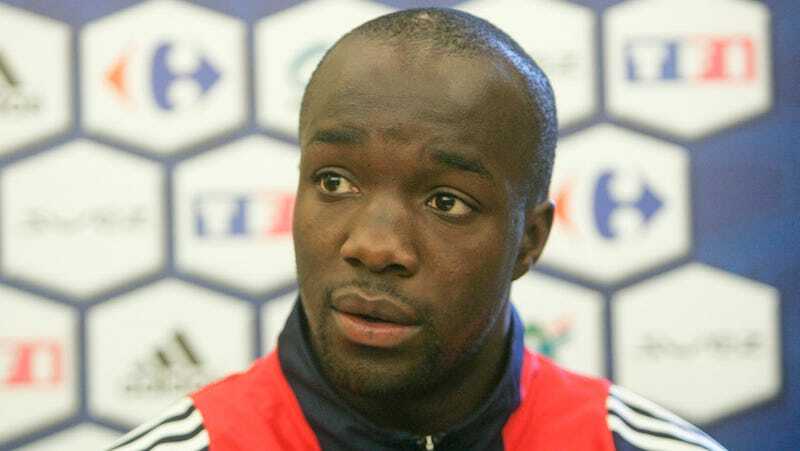 Yesterday, the Daily Mail published a piece about former Arsenal and Real Madrid star Lassana Diarra. The 29-year-old French international is under contract at Russian side Lokomotiv Moscow, but rumors abound that Lass moonlights as a warrior for Islam. 1) Lassana Diarra is Muslim. Muslim extremists? Also Muslim. 2) This guy, who (we guess?) appears to be Muslim and definitely appears to be extreme, maybe appears to look kind of like Lass. We can't tell for sure, but look at the bridge of that nose. That's it. That's all the evidence. But what more do you need? This photo of of Maybe But Probably Not Lassana Diarra has made the rounds online, which is why Diarra's lawyer, Eric Dupond-Moretti had to go on the record, saying that the player "denies in the most formal, the most categoric, the most absolute fashion that he has gone to Syria." In fact, Dupond-Moretti continues. "He has never set foot in Syria. It's absurd. He is not a jihadist, he is a footballer with Lokomotiv Moscow." As much as I criticize Wegener this isn't his fault. people who met him turn into ballet dancers not this. This is what happens when you meet Mourinho. You kick legs first, mug referees, and then at the end you go to syria. Next in line Pepe. Just facts. For now, we'll just have to take Diarra's word for it—at least until Sunday, when Lokomotiv play Anzhi Makhachkala in the Russian Premier League. Diarra trained yesterday, and is expected to play Sunday. I guess that's when we'll see. And if our masked jihadist isn't Lassana Diarra, then who is he? Our money's on this guy.